Únicamente la verdad is a major production for the Ortiz Torres’ siblings, a wonderful contemporary opera in the citywide Festival de México, which took place from March 11-28, 2010 in Mexico City. After years of conceptualization and production, visual artist Rubén Ortiz-Torres and his sister, the music composer Gabriela Ortiz, premiered their opera, Únicamente la verdad (Only the truth), last Thursday in Mexico City’s Teatro Julio Castillo. This new opera is an interpretation of the many myths and stories about a character, Camelia la Tejana. Its plot unfolds in contemporary times in the border region of Mexico and the United States. The opera’s overture is powerful, and it is accompanied by a rapid, tense performance of illegal border crossing. The opera's stage set is simple and elegant: around the perimeter of the theater is a square, wooden platform as wide as a common sidewalk. Its edges are connected through the center by a mechanical bridge. This perimeter stage is elevated about three meters from the ground, and underneath, partially visible, plays the orchestra. 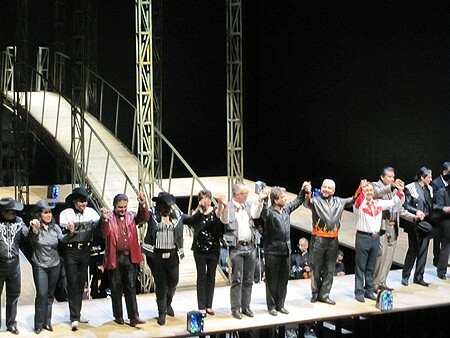 The bridge is the only stage element that is mobile—at once curved, it is uncurled and raised depending on the scene. But this does not lessen the stage from being dynamic, as it is constantly being redefined with each act’s choreography. Different videos play in the background, as well as in the left- and right-hand walls of the stage, at times showing photography of landscapes, and at other times with more abstract, text-based or figurative animations that complement, or even question, the narratives sung. The “Tejana” in Camelia’s name tells she is from Texas, one of the first truths questioned in the opera. According to most legends, though, she became known after assassinating her lover, Emilio Varela, due to an unexplained betrayal involving marijuana trafficking. After Varela’s death, Camelia la Tejana was increasingly implicated in other deaths, one of which was Eleazar Pacheco Moreno’s train-track suicide in the crime-ridden city of Ciudad Juarez. In Únicamente la verdad men who claim to have known her, sing about her life, often with contradictory stories. “Contrabando y traicion” (Contraband and Betrayal), a 1970s popular song by the music band Los Tigres del Norte, made Camelia la Tejana legendary. The band’s piece also popularized corridos —narrative songs characteristic of northern Mexican music, often telling stories about infamous criminals, small-town heroes, and immigration— and, more poignantly, narcocorridos— ballads with themes about narcotics, drug trafficking, and other illegal activities. While Camelia la Tejana is largely considered a fictional character, Alarma, the sensationalist newspaper covering the story of Pacheco Moreno's suicide in Ciudad Juarez, claims she exists in real life. And many people believe this, too. A photograph illustrating the scene of the crime attributes a weeping woman next to the mutilated body of Pacheco Moreno. As mass media takes over the story, different impersonators of Camelia la Tejana have begun to appear in real life, claiming the infamous identity of this woman, and developing more and more fables about her. We also hear from these Camelias in the opera. Combining the folkloric corrido with orchestral interpretations of classic and pop music, mixing recorded soundtracks (by Gabriela) with digital videos (by Rubén), and interpreting a common-person fable in the high-form of opera, Únicamente la verdad knits one and a dozen different stories of Camelia la Tejana. The multiple perspectives and narratives given to a single character and event, like the assassination of Varela at one point, and the suicide of Pacheco Moreno at another, bring to mind structural aspects previously worked in film, such as in Kurosawa’s Rashomon. With some likely reference to Peter Watkins’s Paris Commune, the opera Únicamente la verdad also incorporates —in a creative off-stage live performance that’s doubled with live closed-circuit video— mass media’s role in popularizing, aggrandizing, even distorting a story.